This post will be a little different from most since I’m not sharing a recipe. I promise to be back soon with something to cook. I always find apple time irresistible! 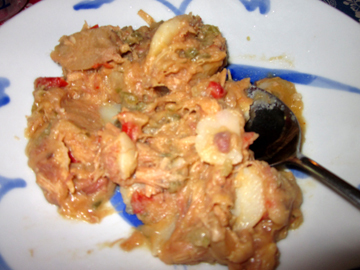 Today I’m simply describing an eating experience I encountered courtesy of Hurricane Irene. As readers of my blog about caring for my mother know, my hometown of Hawley, Massachusetts, was hard hit by Irene … despite the fact that she had supposedly been downgraded to a Tropical Storm by the time she reached our community. The roads in Hawley hew to the tradition of roads in many small communities—particularly hilly small communities. Our byways are built alongside brooks and rivers. Most of the time, this is a great idea. Why carve a road down a hill when you can just follow a stream around the hill? During a hurricane, however, having one’s roads follow a river seems a lot less smart. Large parts of Hawley (including my own area, Pudding Hollow) were cut off during and after the hurricane by washed-out roads. As a result, Hawley had its first ever (to my knowledge, at any rate) visit from FEMA. Federal and state officials helicoptered in to plan road repairs, bring medical help to a neighbor in need, and share food and water. The food in question was a group of MREs—the ready-to-eat meals favored (or at any rate consumed) by our armed forces in the field. Naturally, as a food person, I was fascinated by these. My mother and I really had no need for food. (Please don’t tell FEMA; this might be some sort of fraud!) Nevertheless, I asked for three of the meals. The one I actually tried sounded intriguing. 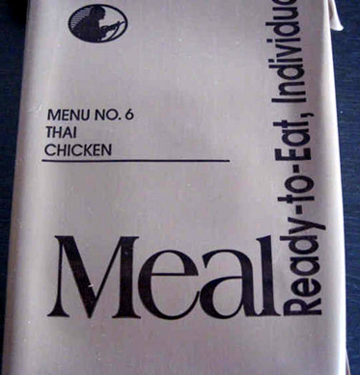 One somehow doesn’t expect to find Thai Chicken in MRE form. A friend reminded me that Hawley is a bit far from Thailand. Even New York, where the MREs originate, is far from Thailand. So I’m not sure why I expected the food to be good. I guess I hoped it would be for the sake of the troops. 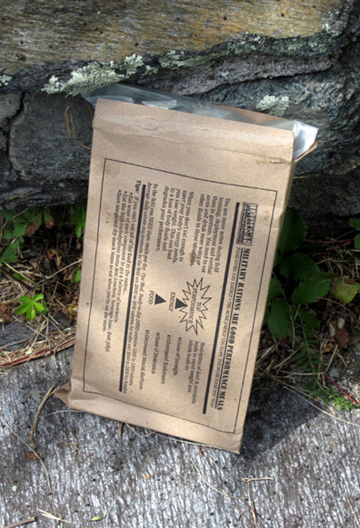 It took me a while to read the (very small, very obtuse) directions for heating the MRE with its “flameless heater,” a chemical pad that reacts to create heat when one adds a little water to its bag and then puts the bag in a box. The box is then rested on a rock “or something,” according to the directions. Even after I managed to decipher the directions, I didn’t quite heat the food correctly. I put both the chicken and its accompanying rice pilaf in the heater bag. Only the one closer to the little pad actually got warm. I resorted to my microwave for the other—not an option open to soldiers in the field. The chicken and rice proved sadly bland … even when I added a little hot sauce from the enclosed miniature bottle (a nice touch). The dishes’ consistency was off putting as well; both were gummy. The rest of the meal was pretty darn odd but designed, I guess, to put protein into soldiers. It consisted of vegetable crackers (today’s hard tack) with peanut butter, a peanut/raisin mixture, instant coffee (a tea bag provided an alternative), and chewing gum. My friend Brett informs me that he and his fellow members of the 379th Engineers subsisted on these meals for weeks at a time overseas. The whole thing gave me a renewed appreciation for our men and women in uniform. Risking their lives and leaving their families are bad enough. Having to eat bland, boring food … now, that’s too great a sacrifice. When I learned that National Guard troops and other officials were working on the roads out of town it occurred to me that these men might be subsisting on MREs. I hastened to bake them some butterscotch brownies, and my neighbor Alice and I drove down to the road-construction site (very carefully) to distribute the treats. I wish I could do the same for our troops everywhere. Meanwhile, if you would like to help with hurricane relief in our area, please consider contributing relief supplies to the drive at our local elementary school, Hawlemont School in Charlemont. Coordinator Beth Bandy is asking for bottled water, nonperishable foods, cleaning supplies, baby food/formula, pet food, clothing, and anything else that might be helpful. She is also looking for drivers with hardy cars to deliver the supplies. For more information on the drive, call Beth at 413-337-4291. Beth has also set up a Facebook page for her efforts. And if you’d like to hear an abridged audio version of my blog post about our own hurricane experience, here’s the link for my commentary on WFCR-FM.